Are Expats Exempt From ObamaCare? For older US expats the answer is reassuring. With Medicare, even if you live overseas only part-time, you don’t need to fret about the fine print of the Affordable Care Act. Medicare qualifies as meeting the “minimum care requirement” so you don’t need to sign up for ObamaCare, nor pay any fee for not participating. If you are not on Medicare, TRICARE, or other health plan that covers you in the US, it can get more complicated. Although, if you are a full-time expat, you are probably exempt regardless of your healthcare coverage. All Americans must have healthcare. Furthermore, all Americans must share responsibility for ensuring this health care coverage. Therefore, every US resident must obtain minimum health care coverage or be subject to additional taxes. These additional taxes help fund health care for those who cannot afford it by themselves. If you aren’t a US resident, you are exempt from the Affordable Care Act. That means the majority of expats are exempt from ObamaCare. 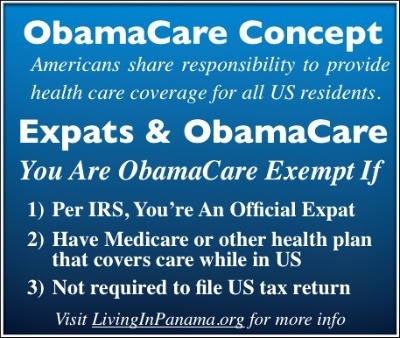 ObamaCare uses the IRS’s definition and tests to determine if you are an expat. Are you an Expat, per the IRS? The IRS Uses 2 tests to determine if you are an expat, for the purposes of Obamacare participation. 1) 330 Day Abroad “Physical Presence Test” – To qualify, you need to be out of the US 330 days out of a 365 day period. That is, in any given 12 month period, you can only be in the US for a maximum of 35 days. If you cannot pass that expat test, then you can try to pass the more difficult and IRS-reviewed “Bona Fide Residence” test. 2) “Bona Fide Residence Test” To qualify, you need to be living abroad for at least one year and have no immediate plans to return to the US on a permanent basis. This is a much more complicated test to prove and pass. For more information on this, please visit IRS’s Publication 54 at http://www.irs.gov/pub/irs-pdf/p54.pdf . If you pass either of these 2 tests, you qualify for foreign residency, that is you are an official expat, according to the US Government. That means, since you are not a resident of the US, you don’t need to procure the “minimum care coverage”. It does not matter what, if any, health care you have in your official ex-pat residence. ObamaCare only applies to health care while in the US. If you don’t pass either of the expat-qualifying tests above, you still may not have to do anything new or different to comply with ObamaCare. Remember, the point of the Affordable Care Act (ACA) is for all US residents to have minimum healthcare coverage. So if you already have qualifying health care while in the US, you are sitting pretty. Do You Already Have Obamacare-Qualifying Healthcare? Then you must take action to comply with ObamaCare. Part-time US residents must have US healthcare coverage. You need to obtain minimum coverage within 30 days of returning to the USA. Pay the penalty/fee to the IRS (and have no health insurance protection). In 2014 the fee is $95 per person per year or 1% of income, whichever is greater. If you chose this no insurance option, I don’t know what your potential cost will be if you do have a catastrophic event while in the US. It could eat up all your assets. Or if you have no assets, it could be free if you show up at the ER of a public hospital. US law requires public hospitals to treat emergency indigent patients for free. Of course, if your income is below the IRS filing limits, then you are exempt from the Affordable Care Act. See the Resource section below for links to discover if you qualify. State health insurance exchanges are insurance pools for each US state that cover people who either cannot afford or cannot get medical insurance coverage. State Medicaid programs are projected to increase per the ACA, but many many physicians refuse to take Medicaid patients. The State Exchanges are expected to fill in this gap. The ACA will reimburse the States 100% of the costs of these exchanges from 2014 through 2016. Then the Federal Government is proposing to reimburse the States 90% of these health care costs. States have either implemented a state run health insurance exchange, or let the federal government run the health insurance exchange for them. For more information on these exchanges and to see if your state runs their own, go here. Regardless of who runs the exchange in your state, you can access it by using the main Federal ACA Marketplace site, https://www.healthcare.gov/. You can sign up for a state exchange when you return to the US, or you can start the process from outside the USA. You must be a resident of a state to apply. You can use your own US address, or if you don’t have one, you can use the address of a friend or family member willing to say that their address will also be your residence. You don’t have to worry about the open enrollment periods. There are special rules that allow people to sign up for insurance, even outside the open enrollment periods. If you decide not to apply before you arrive in the States, you can get a travel insurance policy to cover you until your US insurance kicks in. Remember, you need to obtain minimum health care coverage within 30 days of returning to the USA. The ACA penalty fees are only incurred for the months in which you don’t have health care coverage. If you are on a qualifying plan for even one day in a month, you are considered covered for that month. The non-comply fees increase over the next 3 years. 2014 – $95 per adult ($47.50 per child) with a max of $285 per family OR 1% of your family income, whichever is greater. 2015 – $325 per adult ($162.50 per child) with a max of $975 per family OR 2% of your family income, whichever is greater. 2016 & beyond – $695 per adult ($347.50 per child) with a max of $2085 per family OR 2.5% of your family income, whichever is greater. The information in this post applies whether you live in Panama or in another country. I have tried to layout the ObamaCare situation for expats as clearly as I can. However, I am not an expert about the ACA rules you need to follow. I recommend exploring further resources to determine your best response to Obamacare in your unique situation. I have listed some other resources, by category, below. Do I Qualify for the Expat-Exemption? There are more details on various exemptions to ACA as well as how to qualify as a expat or non-resident US citizen at https://www.healthcare.gov/exemptions/. Does my income make me ObamaCare exempt? If your income is low enough, you are not required to file a tax return with the IRS, which means you have no responsibilities under the ACA. To find out if you are required to file a federal tax return, use the IRS Interactive Tax Assistant (ITA). Keep in mind that the plans offered via the MarketPlace only covers care in the US. For 2014, open enrollment ends on March 31, 2014. The page to visit is https://www.healthcare.gov/marketplace/individual/. Are You Eligible To Buy Health Insurance via the MarketPlace? This site will answer many of your questions about the coverage in your state, especially if your state opted to have their own health exchange program. The federal government is still figuring out the rules for the states that did not opt to run it themselves. You can buy state exchange health insurance via the marketplace, at https://www.healthcare.gov/marketplace/individual/. That site will redirect you to your individual state health exchange site, if your state opted to run their own exchange. Otherwise you will stay on the federal site to purchase (or learn about) your health insurance options. In my research, I found the following 2 blogs had very useful information. I am especially indebted to the information I found in the first one listed below, yucalandia.com. I hope this information was helpful to you. Please comment below. There is another exempt option (besides being Amish or Mennonite!). My family is a member of a healthcare ministry. That is a non-profit where all members share in the health care costs of the other members. We researched the big three and went with the one that’s been around the longest. Thus far, it’s been a very good, affordable choice. Readers might want to check them out, and see if they cover people living out of the country. I am applying to be a citizen of panama and to maintain my us citizenship any suggestions I fell due to the taxes and the lack of moral stability its time for a change . This is really great and comprehensive info. Thanks!